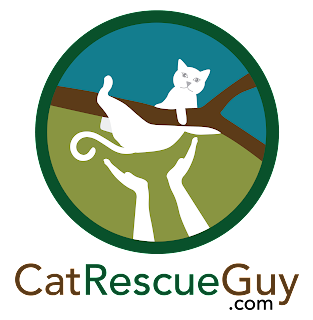 For whatever reason, most of my cat rescues occur on Mondays and Fridays, and it is rare for a rescue to happen on a weekend. So I was a bit surprised when my phone rang on a Saturday morning, and Jennifer, the caller, told me that one of her cats was stuck in a tree. 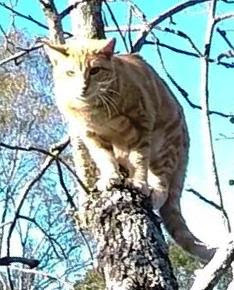 Hippy, the orange marble tabby cat, had been stuck in the tree for two nights, and the temperature on both nights had been very close to freezing. Hippy had been wanting to get back down on the ground badly, but just did not know how. It was an hour and 20 minute drive to the site, and there I found Hippy resting calmly about 45 feet high in the tree as seen in this picture. The base of the tree was surrounded by wild vines, bushes and small trees, and I would need to clear at least a small area in order to be able to get my rope in the tree. Jennifer helped as we cleared a small area, and then I got to work. Hippy peered over his branch intently watching me as I worked, and then he jumped down to the next branch a few feet below and waited there. I was not sure what to expect from Hippy. I heard information about him that suggested that he might be receptive to me, but I also heard the contrary. As I climbed the tree and came close to his level, however, it was very clear how he felt about me. In spite of my deliberate attempts to climb slowly and talk to him in a sweet voice, he did not like me one bit, and he voiced his disapproval with an unmistakable growl. He had walked out on his branch a small distance, and as I approached his level at the trunk, his escape route up higher in the tree was cut off. I was glad that he had not made an attempt to climb higher before I reached him. Now that I was there, it was highly unlikely that he would try to escape higher. With his fear and hatred of me so apparent, I decided to just give him some time to learn that I am not a threat. I wanted to offer him some food, so I began to prepare it for him. While I was looking away to get the food, he began looking for another escape route. The only other direction to go was down. Hippy is not an indecisive cat. He found an escape path down and did not hesitate to take it. I was looking away at the time, and by the time I turned my head back toward him, I saw him in mid-air and watched as he fell to the ground 40 feet below. He pushed through some feathery branches on the way down but spread his legs and arched his back just the way he should. When he landed, he immediately ran toward his house and hid under it. At the time, I thought he had fallen. Afterward, however, when I watched my video, it appeared to me that he made a deliberate decision to jump. Two days later, however, Jennifer shared with me the video she recorded of the event, and her video made it clear what Hippy was trying to do. From her vantage point, it is apparent that Hippy was just trying to jump to the branch below him. Unfortunately for Hippy, there was a small limb on that branch that interfered with his landing and threw him off course all the way to the ground, narrowly missing the wooden fence below. I have to hand it to Hippy: it takes a lot of courage and confidence to make a jump like that at that height. While the outcome was not what either of us wanted, he survived the longer-than-planned fall just fine. Within minutes he came out from under his house, ate a whole can of food, and began getting playfully reacquainted with his siblings. The first video below is the one from my helmet-mounted camera. As I am getting the food out of the carrier, look at the upper far right of the frame to see Hippy making his jump. From this perspective, it appears he deliberately jumped to the ground. The second video, however, from Jennifer's perspective, shows more clearly that Hippy simply failed in his attempt to jump to the the branch below. His jump occurs shortly after the 3 minute mark. Many thanks to Jennifer for providing this video.